At this point the adrenaline rush of being admitted to the event was wearing off. I looked at how the Ex Gays were all relating to each other. They were friends and smiled a lot at each other. They were all handsome, fit, polite, soft spoken and very poor. According to Haji, Georgina was there for the money. But the others? Each of them had their ‘seduction by a foreigner’ story, which at times, also sounded like the tales of jilted lovers. Another common element of their stories was the loss of family and community for being gay. Because there are no jobs in Uganda they depend economically and emotionally on their families and community. There is no real organized gay community to rely on or be a part of. They were being Ex Gay because they couldn’t live without their family or community. It was better to lie to even themselves, than to be hungry, homeless and alone. Even with this sacrifice of their gayness, they believe they are still in danger. That being Ex Gay won’t save them. All of them felt frightened that day, except Georgina. They wanted to know about asylum in other countries. I truly felt pity and love for them. I could only be kind and warm with them. The only medicine for their internalized hate is unconditional love. Georgina aside, I believe these Ex Gays are the victims of homophobia. And that the law will create many more. It will pervert the souls of the next generation of LGBTI Ugandans now growing up. Talk about child molestation. The suicides have already begun. Hours of hateful speeches by the religious leaders and kids groups singing songs like “Bye Bye Homosexuality”. The Ex Gays were singing it as well. When Pepe and I had discussed my attending this event I told him that I needed to feel with my own heart the hatred that he felt every minute of the day in his country. I was very much feeling the hate and realizing that this event would forever change how Ugandan society deals with LGBTI people. 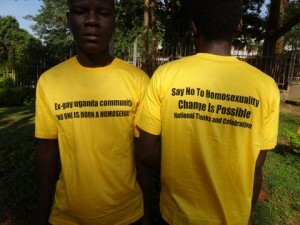 This was the start of a Ugandan LGBTI genocide. Finally, Museveni drove up on the stage in his version of the ‘Pope mobile’. I stood up, not out of respect, but because I wanted to see him with my own eyes and feel his hate in my heart. Clearly the gay issue is being used by him and his party to divert attention from the poverty, unemployment, terrible roads, poor schools, lack of healthcare and all the oil money and USAID money he is stealing. What is so sick about American evangelical involvement in places like Uganda is that they are aiding and abetting dictators who are declaring war on their own people — all their people — by using LGBT people as a scapegoat for their problems. Leaders like Museveni inflame their people by claiming that homosexuality is a colonialist threat. The truth, however, is that the only white colonialist types involved are the American fundamentalists who are more than willing to help thug leaders give their people over to poverty, disease and starvation, simply because they’ve lost the “culture war” in the United States and they’re looking for somewhere to export their hate. Read all of McCarthy’s piece. It’s worth your time.